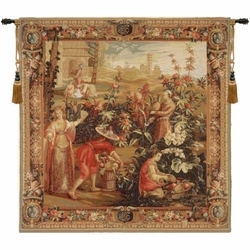 This piece is part of a 10 tapestry series entitled "The History of the Chinese Emperor" commissioned by Louis Alexandre de Bourbon, son of King Louis XIV, to the Beauvais Manufacture, for the Rambouillet castle. This design was considered extremely exotic for the time - the end of the 17th centuryduring which time the Jesuite missionaries were returning from China with tales and knowledge that were to influence the royal courts of Europe. Backed with lining and a tunnel for easy hanging.